Gold investors are wondering whether rising interest rates are bad for the gold price, because in the middle of a Federal Reserve tightening cycle where the money supply was being contracted, theoretically the prices of precious metals should drop. 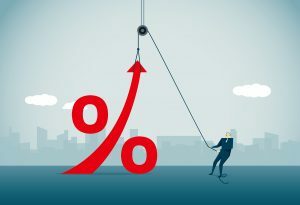 But these are not typical times, and Fed policy is great news for those who own gold, primarily because the past decade of central banking actions has inflated bubbles that are even bigger this time around, and that are seemingly less well equipped to handle higher interest rates than ever before. Leaving aside the probability that the Fed would respond to this scenario with a money printing campaign that would make previous QE programs pale in comparison, there are many reasons to believe there would be a spike in demand for gold. One of the primary appeals of gold was to protect against systemic risk, market chaos and currency devaluation. Yet over the past 7 years, as these conditions have been further exacerbated while the metals have languished due to the suppression of the market, it’s been easy to lose track of how gold should be trading. If rates go up and the bubbles pop, investors will sell other assets. That frees up investment capital for a precious metals market that is under-subscribed. Given the type of market chaos guaranteed by economic and political actions, the incentive for investors to buy gold as insurance is greater than ever. Even if the Fed really did contract the money supply and somehow the bubbles stayed intact, gold would still likely rise based on how much catching up in price it has to do. We are past the point of no return. Whatever the Fed does is ultimately irrelevant from a long-term standpoint. It has delayed the inevitable but, should it stay on course with the tightening policy, it still leads to the same outcome. Whatever the Fed does, the outcome is ultimately beneficial to having metal over dollars.